Freecharge offer, get Rs. 20 cashback on Rs. 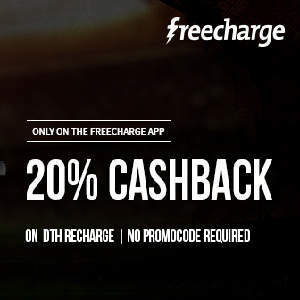 100, FreeCharge Wallet Offer, Get Flat 20% Cashback on Freecharge. Freecharge wallet offer:- Recharge for Rs. 100 and get Rs. 20 Cashback Instantly. Valid only on Freecharge Credits, this is the first offer that you can get using freecharge credit. Valid till 29th March.